Today is exactly 2 months since the start in Ljubljana. It wasn’t a long day, but one with a long history, if you will. 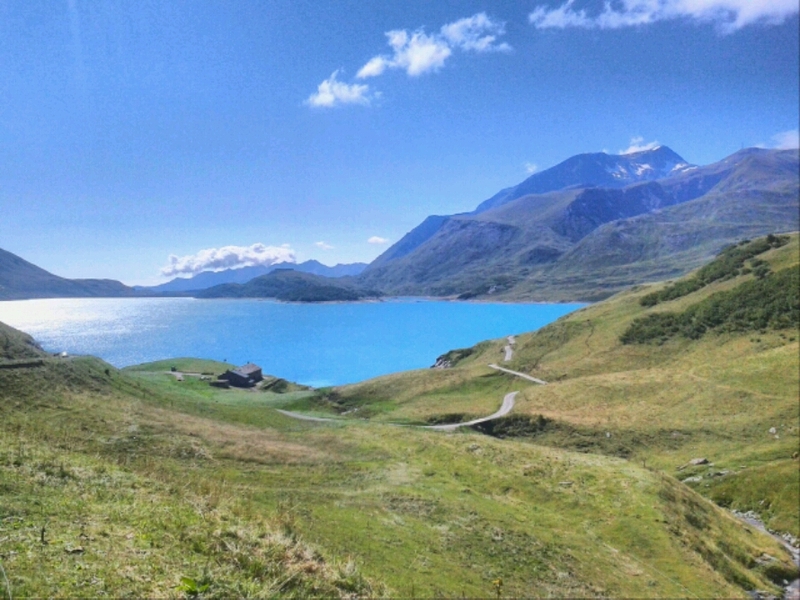 From the (very nice) youth hostel in Lanslevillard in the morning I ascended to the Col du Mont Cenis (2081), which many historians believe is where Hannibal crossed the Alps with his army of Carthaginians and elephants, on his way to Rome. Today it’s just a road pass with a large artificial lake, with the bluest water I’ve ever seen (except perhaps on the Croatian coast), but no signs of elephants; there are still some signs of armies – numerous old French border fortifications scattered around. 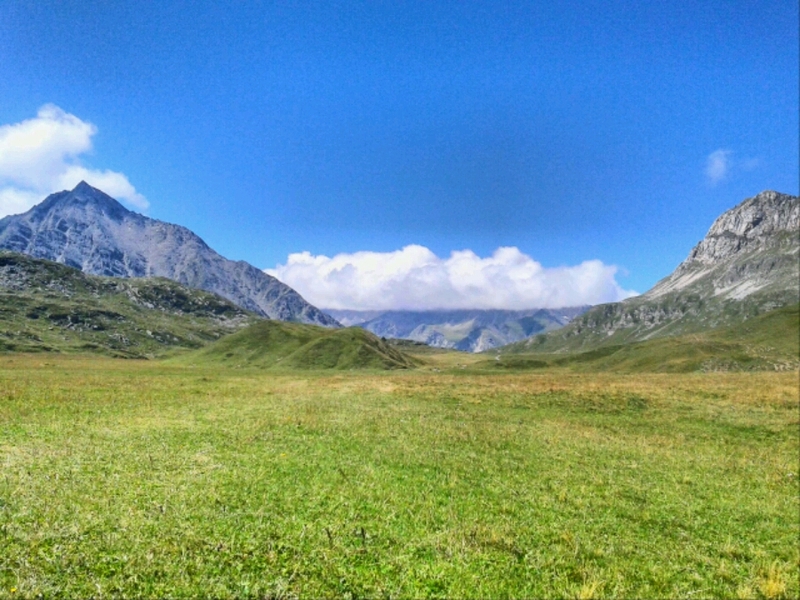 Yet a sense of history remains, if one tries to imagine the sight of Hannibal’s army crossing the vast grassy plain at the top of the pass. In the youth hostel I met a group of academics from Stanford on a mission from the National Geographic Society to study historical glacier changes in the area… and seek traces of Hannibal. Although it was nicely sunny all day, the same fierce westerly wind which has been blowing for days kept things very chilly. It wasn’t so enjoyable walking around with this wind in my face. 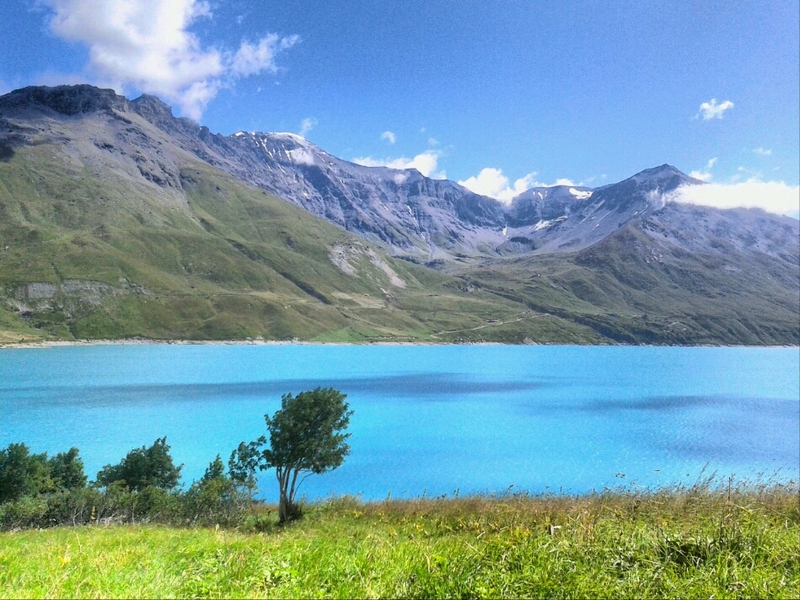 So after heading along the lake and then westwards over the Col du Petit Mont Cenis (2183m), I only descended to the Refuge du Suffet, in the isolated valley of Le Planay, to spend the night there. The next alternative goal, a refuge in Italy (since sleeping in the tent is out of the question in this cold), would have been another five hours away. 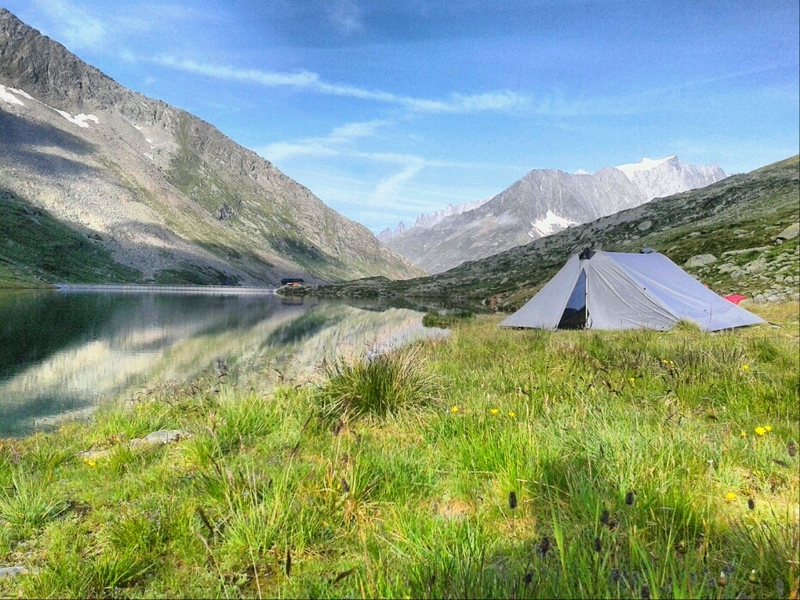 I bought this tent last year; I ordered it from the USA for a shorter trek which I had planned with a friend last summer in the Kaçkar mountains of Turkey, but the German customs agency held it, and it never arrived in time. So the first time I really got to use and test this tent was on this trek, starting the first night in Slovenia. A small American company called Six Moon Designs produces the tent. I’m really a non-expert as regards tents, but I bought this one after quite a lot of research, it being the lightest full-scale tent I could find for a reasonable price. It’s quite an ingenious design: it saves a lot of weight by having practically no internal frame; no metal. 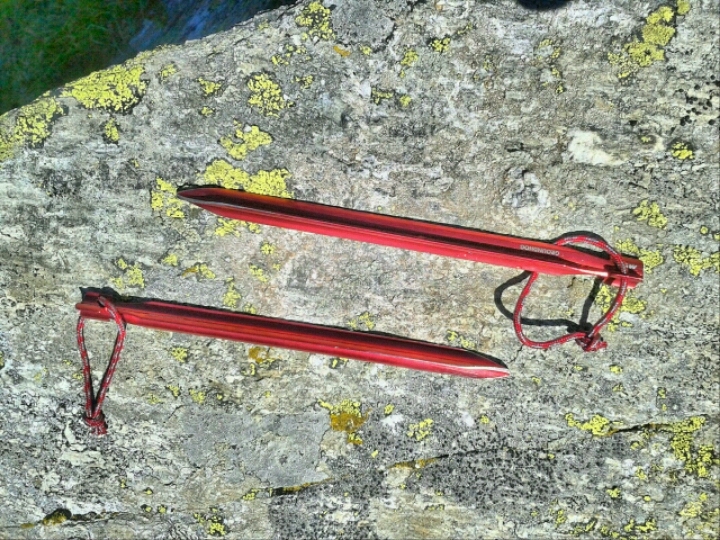 It weighs only 1.2 kg and stands on the trekking poles, which I’m carrying anyway, and is held to the ground by eight stakes. At this minimal weight it offers enough space for two people to sleep in reasonable comfort, or one person to sleep and spread out their stuff. The outer material is waterproof silnylon, forming a roughly hexagonal shape. Inside there is a rectangular sort of cage, consisting of mosquito netting on the sides, and a waterproof floor. This leaves some space covered against the rain by the hexagonal roof, but outside of the rectangular inner “clean” area, for dirty things like hiking boots. Overall I would be very happy with this tent if it wasn’t for one major thing, which those reading this blog since the beginning will already know about: the tent collects immense amounts of water. And I don’t mean rain. On almost all nights the walls/roof have become covered in condensation; lots of it. Touching the walls/roof makes water drip down. Twice the water froze, covering everything with ice. Apart from being annoying, the water problem is potentially pretty bad for my down-filled sleeping bag, which should never get wet (so I have to consciously stay away from the sides at night). 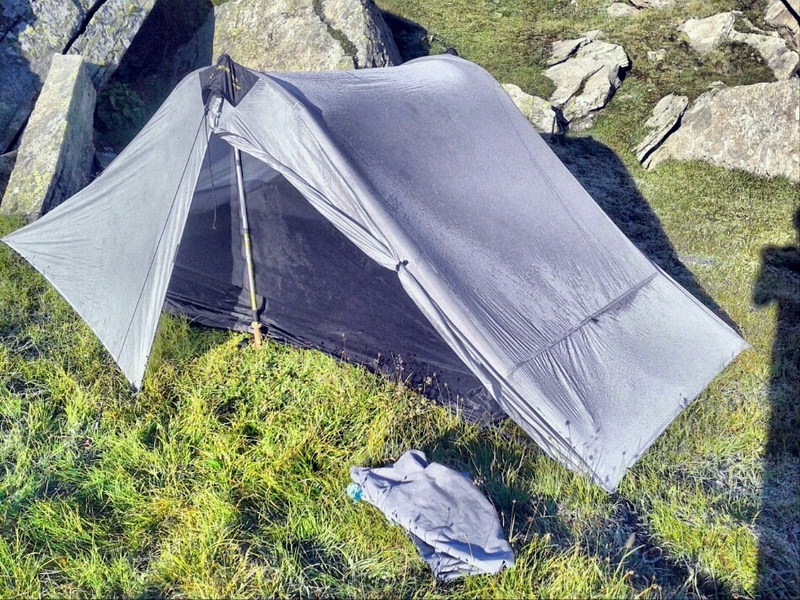 In the mornings I normally need between 20 and 30 minutes just to dry the tent by wiping it down with my towel bit by bit on the inside and outside; and even so it is heavier to carry because some moisture remains, and I have to unpack it later in the day or in the evening to finally dry it out. I haven’t been able to find any solution for the wetness problem; even when I’ve kept the “doors” (the sides) completely open and let the breeze blow through on milder nights it has still collected lots of water. That fundamental nuisance aside, the tent is generally a good product. The design is very practical, versatile, and it is simply unbelievably light for the space and practicality it provides. It packs down to about the size of a small shoe box, about 35 by 20 by 15 cm. It has held up well in fairly strong mountain winds. I can set it up by myself within 15 minutes. 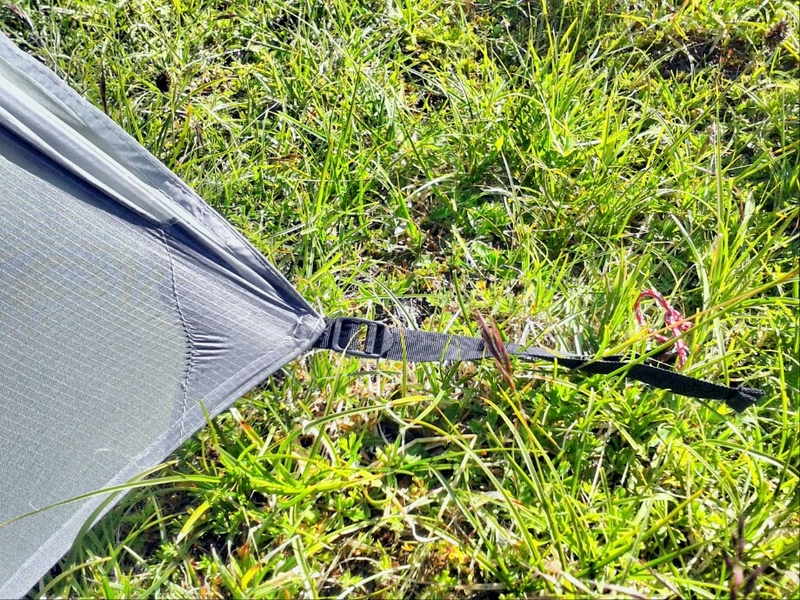 It seems to be durable; no notable damage so far, and the stretch marks I’ve been observing with a bit of concern on the corners have not gotten worse since the beginning of the trek. It’s just the water problem that fundamentally lowers the overall utility – a lot. So my overall verdict would be: if space-for-weight is your only concern, this tent by Six Moon Designs is probably hard to beat. But if you have a problem with spending half an hour with your towel collecting water every morning, try to find something else; probably silnylon is the wrong material. PS: What I can unreservedly recommend are the stakes I’ve bought: MSR Groundhog – of which I’m carrying nine (eight needed for the tent, one extra just in case). They are very light (aluminium) and evidently practically indestructible; I’ve hammered them into the stony ground with a rock many times and not one has yet bent or broken.